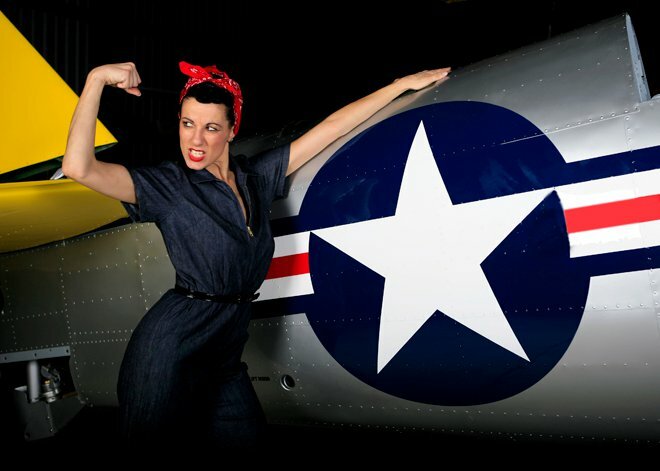 The inspiration for the Rosie the Riveter shots came from a series of 4×5 Kodachrome Photos taken of aircraft workers in the 40’s by Howard R Hollem & Alfred Palmer. The rich colour of the Kodachrome and the black background was what I was trying to reproduce with these shots. The model for the shoot was the lovely Miss Ramona Royale who was wonderful to work with and I look forward to working with her again soon. A big thanks to Cameron Rolph-Smith of Warbird Aviation for letting me take over his shed for the afternoon and moving his planes around. The aircraft used in the shoot were Cameron’s T-6 Harvard, Yak 52 and his Dads T-28.